The Beijing Zoo was around when the Japanese invaded China and occupied Beijing during the Second World War. The commander of the Japanese army worried that the animals in the Zoo might get free during an attack his soldiers while in battle. He poisoned to death all the Lions, Tigers and Leopards in the Zoo and the Zoo was no more. In 1950, the Zoo was re-opened as a public park and on April 10, 1955, it was formally named the Zoo of Beijing. ¥15 includes only the entrance fee. ¥20 Includes the entrance fee and access to the Panda House (Can't see the Pandas without access to where they hang out). ¥40 Includes the entrance fee, the Panda House, and a boat trip around the zoo, Don't do the boat cruise. Just watch the other people and the look of disappointment on their faces. Both sides of the water are lined with tall banks that you can't even see over. See Reviews here. ¥130 Includes the entrance fee, the Panda House, and the Beijing Aquarium. This is the one you want. I oaid it and was not disappointed. The aquarium was the jewel of the day. How do I get to the Beijing Zoo? The Zoo is located in the Xicheng District of Beijing City, next to the Beijing Exhibition Hall and facing the Beijing Astronomical Observatory. The land on which the zoo lies is landscaped and manicured to accent the natural beauty of the land, as well as to provide great habitats for the animals. There are beautiful flower gardens, lawns, trees, and hills that are as breathtaking as the zoo animals! The best way to get to the Zoo is on the Beijing Subway. Get onto line #4 and get off the subway at the Dongwuyuan Station (Beijing Zoo, 北京动物园).
'' subway station. Very easy and fast but not the cheapest. The cheapest way to get to the Zoo is by bus. Look on the bus stops that line the roads near your hotel and get a map at the reception area of your hotel. The maps have all the bus routes included on them. Why would I bother with the Beijing Zoo? The Zoo has taken steps to focus the visitor's experience on the animals native to China. For that reason it is a great way to see such wildlife as The Giant Pandas, Golden Monkeys, Milu Deer and Northeast Tigers. The Sichuan Golden Snub-Nosed Monkey, Manchurian Tigers, White-Lipped Deer, Yaks from Tibet, enormous Sea Turtles, Polar Bears from The North Pole, Kangaroo from Australia, and Zebra from Africa. And don't forget the Zoo also contains more than 100 different species of reptiles, including large crocodiles and massive snakes that eat baby pigs. The Beijing zoo also has a long and storied history that is sure to interest people from around the globe who travel to Beijing. The land where the zoo is currently located was the site of an Imperial manor during the Ming Dynasty. It was called the Garden of Happiness and Friendship at this time. In 1908, the land became a zoo and an agricultural experimental farm open to the public called Garden of Ten Thousand Animals. Many of the buildings from the Qing Dynasty are still intact and open to visitors. Like many of the large zoos around the world, the Beijing Zoo has taken great strides in conserving the world's wildlife and taking great care of the animals they house. 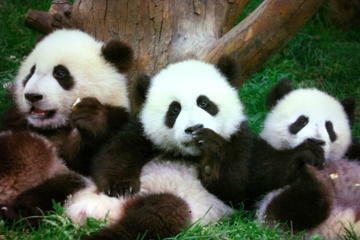 Their programs for Pandas are perhaps the best known in the world. The Panda Hall is a huge facility covering nearly 10,000 square meters (2.5 acres). I am not easily impressed and went to the Beijing Zoo under the impression that the Chinese don't treat Zoo animals very well. The inside of the Panda Hall replicates the style of traditional Chinese gardens and is shaped in the pattern of a Tai Chi diagram. The Panda Hall is impressive to look at but also delivers good practical care for the large and physical animals it houses. Lots of trees and there seems to be a concerted effort to occupy the monkeys with games usually involving the search for food. They didn't look too bored and none of them seemed to hate the constant bickering that monkeys do. The atmosphere in here is much like that of Africa. The air is dry and humid and they'll eat you if you get in there with them. Lions pace when they are unhappy yet the lions in the Lion Hall see to be functioning in a Pride of hierarchy. I really learned a lot about Tigers just from walking into the Tiger Hall. The entire place is meant to emulate the Tiger's natural habitat. This place is amazing and the Tigers are the biggest I've ever seen in any Zoo or on any television screen. How could an elephant ever be happy in a cage? Maybe no animal can but there might be a worthwhile trade off here. The Kids and adults may see an example of animals being treated well and they'll value the animals more because of this. The Gorilla Hall is full of artificial hillocks, rockeries and pools as well as a huge wooden apparatus that the Gorillas climb on, sit on and do just about everything. All the interior walls are covered in an attractive backdrop of murals depicting gorilla habitat. These guys look pretty happy and get treated better than most poor people in China. The Gorillas have their own medical room, a mating room and a specialist feeding room. The best part of the Beijing Aquarium are the daily shows performed by the Dolphins, Sea Lions And Whales In The Aquarium's Ocean Theater.